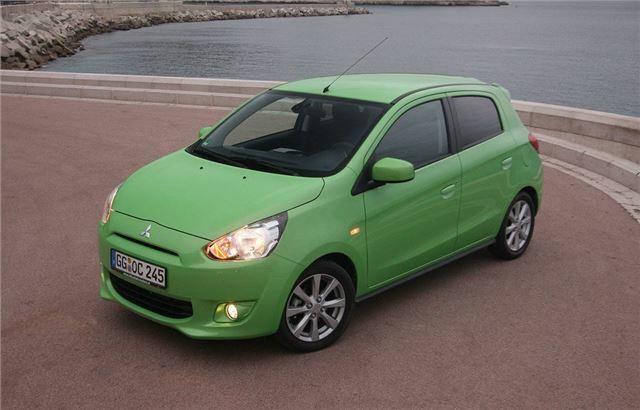 When designing the replacement for the well-liked Colt, Mitsubishi was clear about the focus for its new small car. 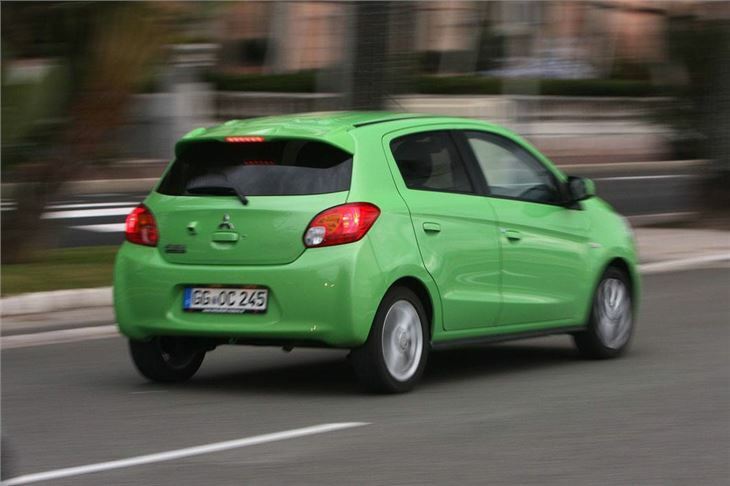 Fuel economy, CO2 emissions and practicality are what the new Mirage is built around. It may not sound exciting but it makes plenty of sense. When new car buyers are looking to keep running costs as low as possible, being able to say every model in your new small car range is tax free thanks to sub-100g/km emissions is a big selling point. 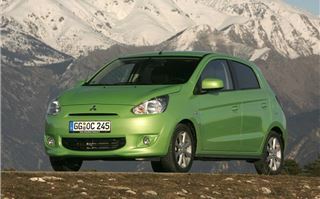 So the Mirage is all about being as efficient as possible and that includes the body shape. It's more aerodynamic than any other similar-sized hatchback which may be good news for fuel economy but does mean the Mirage looks fairly bland. The rounded shape isn't particularly distinctive with a front end that's reminiscent of the Nissan Micra and a rear that has a hint of Toyota Aygo. Inside it's equally run-of-the-mill in terms of design but while there's little in the way of flair it does feel solid and well built. The hard plastics on the dash and doors are what you'd expect of a car at this price and the overly large gear lever feels like it's come straight off one of Mitsubishi's big Shogun 4x4s. 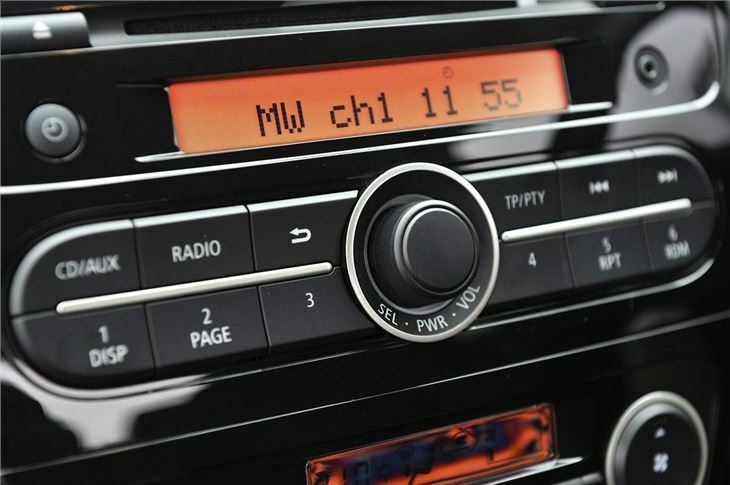 However the steering wheel - an all important point of contact when it comes to first impressions - is pleasant to hold while the stereo and ventilation controls have a quality touch to them. The gloss black trim is a nice detail too and overall it feels well finished. It's surprisingly room inside too. 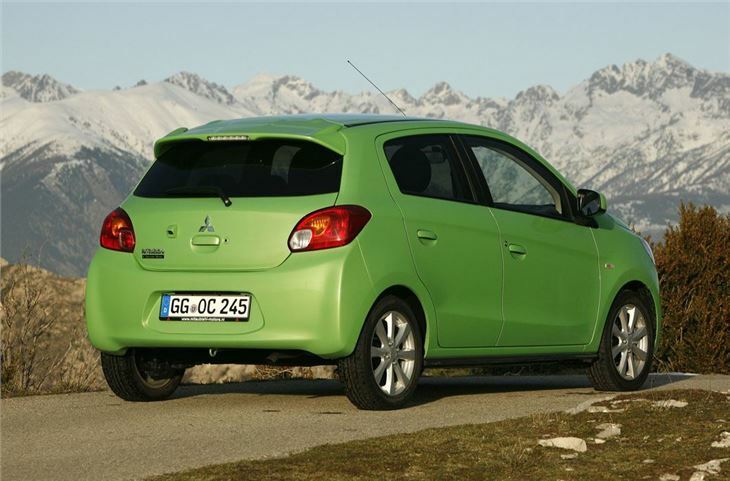 The Mirage competes against a wide range of cars from smaller hatches like the Volkswagen Up to larger models like the Suzuki Swift, so it's tricky to directly compare it to any one model. Put it alongside something like the Nissan Micra and it holds up well though. The driving position is good even though the steering column only adjusts for height, as with most cars this size. There's plenty of space for both driver and passenger - including leg and elbow room - while rear passenger space is impressive for a car that's only 3.7 metres long. I'm 6ft2 and could comfortably sit in the back without smacking my head on the roof or having to train as a contortionist. Getting in and out is easy too thanks the wide opening doors - the Mirage only comes in five-door guise as the demand for three-door versions of small cars is diminishing, so there's no having to clamber into the back. It's practical with plenty of little stowage bins in the front and good sized 235-litre boot. 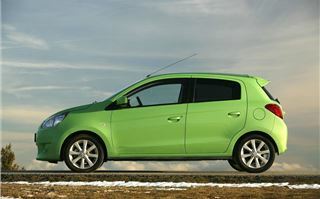 However, unlike rivals such as the Volkswagen Up, there's no clever double-layer boot floor. You notice some cost-cutting here too with a rather thin carpet floor and a flimsy bit of MDF covering the spare wheel well. It's worth noting that the Mirage doesn't get a spare wheel either. Getting rid of it helps save weight so instead you get a can of sealant as part of a 'tyre repair kit'. This weight saving is a key part of the Mirage design though. The car weighs just 845kg thanks to the use of high-tensile steel in the body. That's even less than a Fiat 500 and and not much more than a Smart ForTwo. 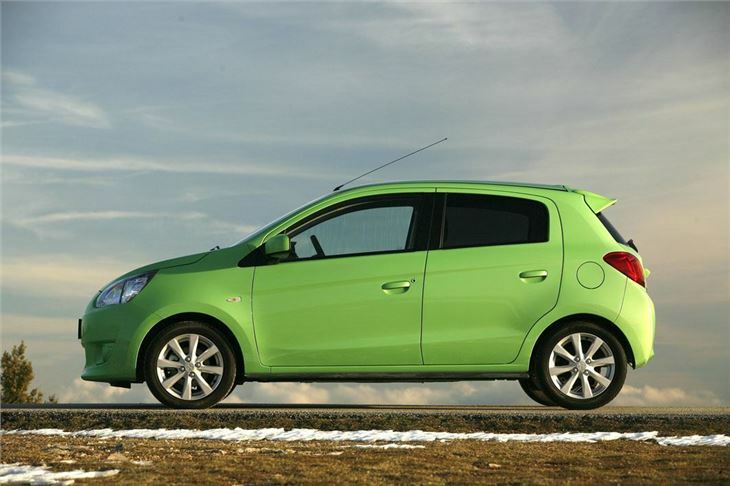 As a comparison the lightest Vauxhall Corsa is 1055kg. As a result it's a surprisingly nippy little performer out on the road. There are two engines, both three-cylinder petrol units. The entry-level model has a 1.0-litre 71PS but the higher specification models have a 1.2-litre unit with 80PS. In terms of power, neither engine is going to set the world alight, but they're surprisingly good fun to drive. You can rev them as hard as you like and they don't become coarse while the standard five-speed manual gearbox has a nice positive shift. On paper a 0-62mph time of 11.7 seconds (for the 1.2 engine) may not look great but the engine has plenty of get-up-and-go away from the lights and there's a nice thrum thanks to the fact it's a three-cylinder engine. 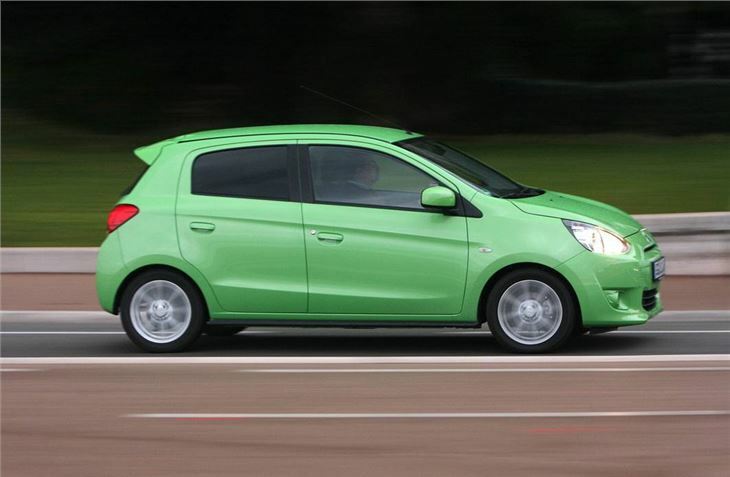 The 1.2-litre makes the most of its modest 106Nm of torque and pulls really well in gear. The Mirage rarely feels underpowered or sluggish. But the real highlight is economy. The 1.2-litre model comes with an automatic engine start/stop system and all models have low rolling resistance tyres and regenerative braking. As a result all emit less than 100g/km of CO2 which means no annual car tax. That's right, zero VED on all models. 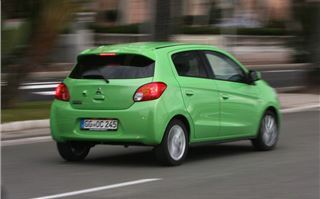 Economy is 68.9mpg for the Mirage 2 while going for the slightly higher spec Mirage 3 only sees it drop to 65.7mpg. On our test drive we were seeing mid 50s and that was with some fairly 'enthusiastic' driving on small rural roads. This is one cheap-to-run car. It's quite happy on the motorway and will more than easily keep up with fast flowing traffic, albeit with a bit of work by the little engine. It's quiet too, helped by the aerodynamic shape and despite the light weight it feels stable at high speeds, even in strong winds. It certainly doesn't feel like a small car here. The opposite is true in town where the Mirage is ideal if you have to get into small parking spaces, helped by a tight turning circle and light steering. 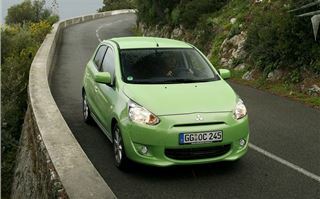 However, it's the electric power steering which lets the Mirage down. It lacks response and there's no feel at all, so through corners you have to put in more steering input than you'd expect. 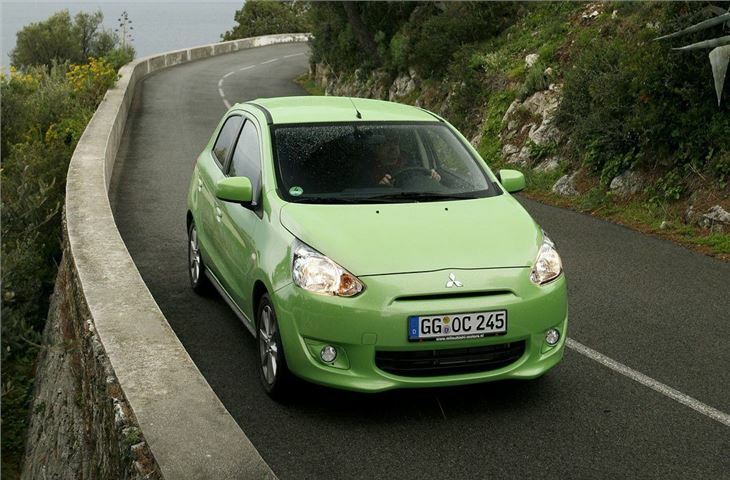 It means the Mirage isn't very assured or comfortable on more demanding roads and even roundabouts can catch it out. Front end grip isn't great either. It's a shame as the Mirage rides smoothly and body roll is kept reasonably well in check through bends. This aside there's plenty to like about the Mirage. It's certainly a step forward over the Colt in terms of refinement and quality, although it's a shame it no longer has the distinctive looks of its predecessor. It's reasonably well equipped too. 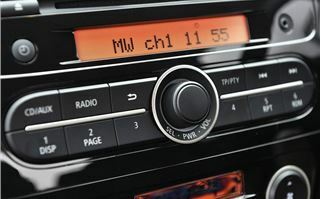 The Mirage 1 - the only model with the 1.0-litre engine - is a little sparse but does come with front electric windows and a CD stereo with aux-in and a USB port. 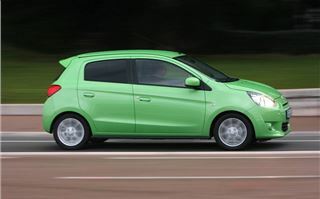 The Mirage 2 looks better value as not only does it get the superior 1.2-litre engine (which is also more economical) but also adds electric mirrors, air conditioning and remote central locking. The 2 has a list price of £10,999 but that's not especially cheap when you look at the competition. A five-door Kia Picanto 2 1.25 is £10,445 while a SEAT Mii Sport is £10,430. Both are better to drive than the Mitsubishi and have nicer interiors too. 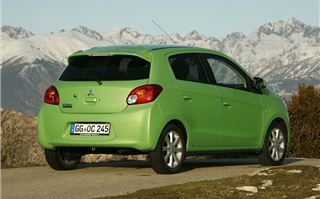 One plus for the Mirage is that Mitsubishi is currently offering £1000 off the list price of all models as part of a launch offer which is expected to run until June and possibly beyond. There is also the Mitsubishi Service Plan available which includes the first three services for an upfront payment of £350 - impressive value for money in our opinion. 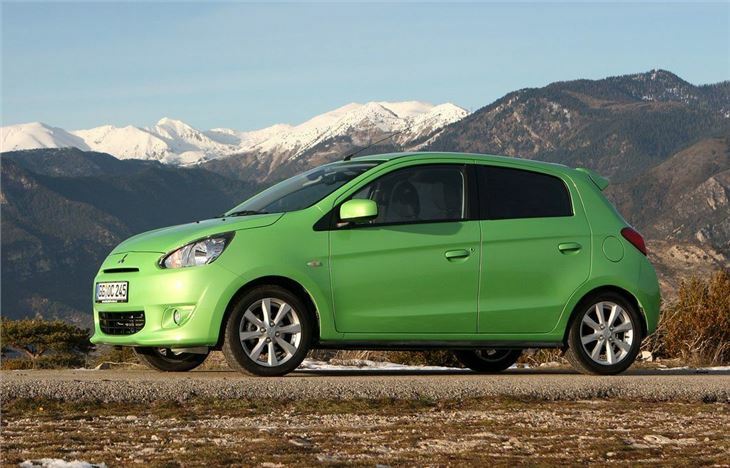 Overall the Mirage is a competent and comfortable small car that's easy to drive and performs well in town and on the motorway. It does lack character though, something which similarly priced alternatives like the trio of the Volkswagen Up, SEAT Mii and Skoda Citigo certainly don't. The Mirage doesn't outdo them in terms of equipment or price either. 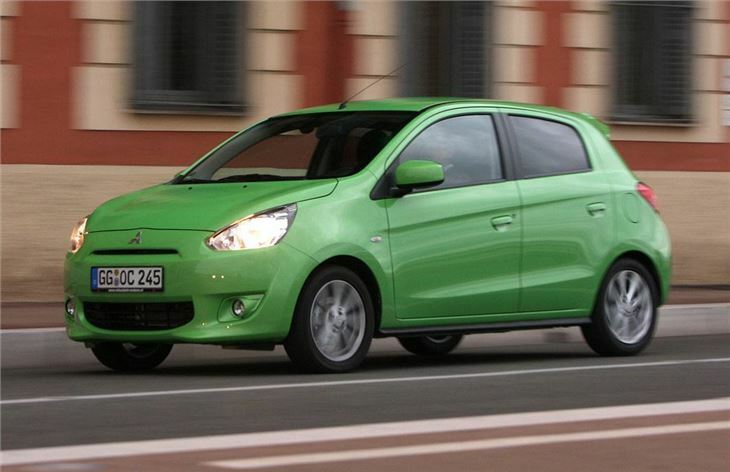 So while it's a good little car, there's not much to make it stand out against the competition. There's plenty of quality for buyers after a small and affordable car and unfortunately the Mirage looks like it has its work cut out to get noticed.